As very massive stars evolve off the main sequence, they sometimes lose more than half their initial mass through dense, slow winds. The stars’ hot cores are laid bare, emitting copious ultraviolet photons that ionize the expelled material, which forms an optically-bright bubble-shaped nebula. The exposed hot core is referred to as a Wolf-Rayet (WR) star, while the discarded outer layers that surround it make up what is known as a Wolf-Rayet nebula. These objects are named after the pair of French astronomers who first discovered them via their unusual spectra, which feature broad emission lines jutting above the continuum. While WR stars are readily detectable (even out to nearby galaxies) because of their unusual emission-line spectra, the origin of the surrounding nebulosity is more difficult to pinpoint because of its close resemblance to other types of emission nebulae, especially planetary nebulae, and the interaction of the ejected material with the interstellar medium. Theory suggests that WR nebulae should emit X-rays. After a star loses its outer layers and becomes a WR star, its stellar winds accelerate to ~1500 km/s—more than ten times the previous pace. These faster winds collide with the previously ejected material propagating into the interstellar medium. This process should generate a diffuse bubble of shocked material that should emit in the X-ray, but this predicted X-ray emission has proved elusive; only a few WR nebulae have been detected in the X-ray. 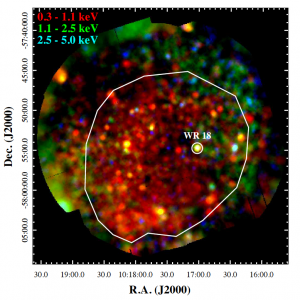 In this paper, the authors use narrow-band optical images and X-ray images and spectra to investigate the properties of the area surrounding WR 18, a Wolf-Rayet star closely associated with emission nebula NGC 3199. The narrow-band optical images in Figure 1 show the bright arc of the emission nebula curving around WR 18. Figure 1. Left: False-color optical image of NGC 3199. WR 18 is circled in red to the east of the bright arc. Right: A map of the [O III] to H-alpha ratio. Two measurements of the proper motion of the star are indicated by the colored arrows. Figure 1 from this paper. Figure 2. False-color X-ray image of NGC 3199. The western (right) side emits significantly more in the 1.1 – 2.5 keV range than the eastern (left) side. Figure 2 from this paper. The authors present X-ray observations of the nebula by XMM-Newton and reveal for the first time diffuse X-ray emission suffusing NGC 3199, seemingly bound by [O III] emission on the southwest edge. (Here, the brackets denote emission via a “forbidden” transition—one that isn’t induced by the most common mechanism and therefore rarely occurs in a laboratory setting.) This discovery cements NGC 3199’s status as a WR nebula—only the fourth such nebula to be observed in X-rays. From the false-color X-ray images in Figure 2 to the right, we can see spatial variations in the X-ray emission. The authors find that the western (right) side emits more in the 1.1 – 2.5 keV range than the eastern (left) side. They then use spectral fitting to extract the global and local properties of the nebula. Most importantly, they find that while the material nearest the optically bright arc is enriched in metals from the strong stellar winds, the material opposite the arc appears to be a mixture of the stellar outflow and the interstellar medium. This implies that the nebular material of NGC 3199 is being actively enriched by the stellar winds from WR 18. WR 18: A homebody mistaken for a runaway? The authors also consider the origins of the optically bright arc shown in Figure 1. It was first thought to be a bow shock formed as WR 18 barrels into the surrounding interstellar medium, which piles up like snow before a plow. This sometimes happens in the case of runaway stars—stars ejected from their natal clusters at high velocities, careening through space with large proper motions; bow shock formation requires that the star be traveling at a very high speed (greater than the speed of sound in the material surrounding the star). However, although the bright optical arc is certainly suggestive of a bow shock, the authors extend an alternative explanation. Because the proper motion of the star is nearly perpendicular to the direction of motion that the bow shock suggests, and because the authors find no evidence that the star’s velocity is especially large, they posit that the morphology of the bright arc results simply from the interaction of the star’s fast stellar wind with a dense region of the interstellar medium. The morphology of NGC 3199 revealed by X-ray observations (namely, the bubble of diffuse X-ray emission bounded by bright optical [O III] emission) is common to the four WR nebulae observed in the X-ray. This result shows that the configuration of the local interstellar medium strongly affects the structure of stellar outflows. Future X-ray observations of WR nebulae can help us understand how massive stars enrich the interstellar medium, and how the interstellar medium can shape the outflows of these stars. Featured image credit goes to Ken Crawford. I am a fourth-year graduate student at Boston University, where I study the upper atmospheres and ionospheres of Venus and Mars. I'm especially interested in how the ionospheres of these planets change as the Sun proceeds through its solar activity cycle and what this can tell us about the ionospheres of planets around other stars. Outside of grad school, you can find me rock climbing, drawing, or exploring Boston.